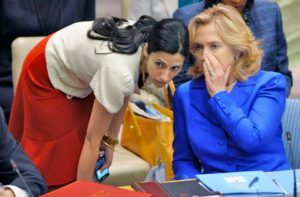 Political strategist Roger Stone, who remembers a time when journalists actually asked tough questions, is looking for someone, anyone, with access to ask Hillary Clinton the following: Answer me these questions three regarding long-time aide Huma Abedin. 1) What is Huma’s relationship with a Saudi Arabian official named Abdullah Omar Naseef? 2) Was he the founder of a Saudi charity called the Rabita Trust? 3) Right after 9/11, was the Rabita Trust put on a list by the U.S. government of groups that were funding terrorism? Most of the media likely declined when they discovered “what is your favorite color?” was not the most challenging of the three questions. Writing for Breitbart, Stone presented evidence of Abedin’s “deep, clear, and inarguable connections to a Saudi Arabian official named Abdul Omar Naseef, a powerful Kingdom insider who has helped lead a group called the Muslim World League. “Hillary Clinton is not some princess and America is not some Muslim kingdom — yet. She’s a public official, and as citizens, we have a right to know who she’s giving access to. We have a right to know who she could be sharing state secrets with.